Please enjoy our latest issue of NH Quarter Notes! You’ll find some great articles in here ranging from folk dancing, jazz big band seating placement, and lighting a fire in your students. Along with all of those articles is all of the great work NHMEA is doing this year. 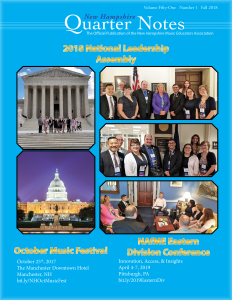 You’ll find everything you want to know about the October Music Festival on page 20, Large Group Festival info on page 10, and updates from our council chairs throughout.